Conditional cash transfers are transfers given to beneficiaries conditional on specific actions such as sending children to school or making regular health visits, and unconditional transfers are those that are given to beneficiaries without any specific requirements beyond eligibility. Conditionality is also sometimes referred to as co-responsibilities, particularly in Latin America. Conditionality is not the same thing as eligibility or enrolment criteria, such as poverty-related criteria or possession of identification documents. The issue of conditionality has generated substantial debate in cash transfer policy and design. 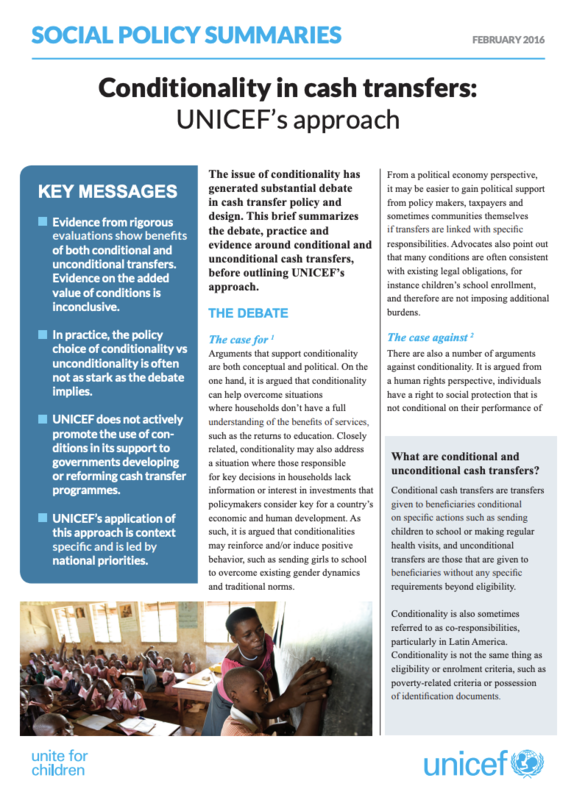 This brief summarizes the debate, practice and evidence around conditional and unconditional cash transfers, before outlining UNICEF’s approach.